Cheat codes and secrets in old school video games have become the stuff of legend. To this day, I can’t tell you a single thing I supposedly learned in high school maths, but I remember the location of enough bonus barrels to beat Donkey Kong Country 2 with around 80% completion, as well as the Dunk from Anywhere code for the SNES version of NBA Jam Tournament Edition (Left, Right, A, B, B, A). My friends and I used to have a gentleman’s agreement with NBA Jam TE, in which we restarted the game if one of us missed inputting a code (or agreed not to use them). After all, there was no way to compete if someone activated Infinite Fire and Dunk from Anywhere! Before the expansion of online resources, finding out cheat codes came down to video game magazines, hint books, and word of mouth. I remember how excited I was when I picked up the latest issue of Nintendo Magazine System (the Australian version of Nintendo Power) and found a whole spread dedicated to basketball video game cheat codes! It’s where I learned the codes for NBA Jam TE on SNES, and found out about the hidden players in NBA Live 96. It wasn’t until my family got connected to the Internet in 1997 that I was able to look up the power-up codes for the PC version of NBA Jam TE, as well as the methods of accessing all the secret characters. NBA Jam’s cheat codes are infamous, but as I mentioned, it wasn’t just the arcade basketball games that boasted secrets. As noted, the SNES version of NBA Live 96 utilised cheats on the Edit Player screen to add missing players, including the Class of 1995 rookies, Michael Jordan, Charles Barkley, and a selection of retired Legends. It also started the trend of unlockable developer players. Entering the names of various members of the development team would generate their players, and in later games, pre-made teams comprised of the developers and QA staff. These squads were phased out by NBA Live 2000, but other games would continue to feature developer cameos. Sim games featured their fair share of wacky cheat codes as well. Kobe Bryant in NBA Courtside featured Big Head mode, and an unlockable disco court. 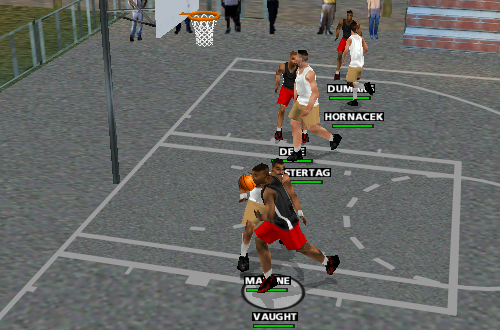 By typing “playground” while a game was loading in NBA Live 99 and NBA Live 2000 PC, it was possible to play on the street court from Practice mode. The Genesis version of NBA Live 95 included a code that activated a hidden golf game, basically serving as a preview of PGA Tour 96. The code made its way into listings for other versions of the game (as well as NBA Live 96), and so for many years, I thought it must have been a hoax, much like all the ways of supposedly unlocking Michael Jordan in NBA Jam. In addition to amusing features and gameplay modifiers, cheat codes have also been used to unlock content such as jerseys, shoes, and gear. In NBA Live games released in the early-to-mid 2000s, it wasn’t uncommon for the current All-Star jerseys to be locked out of the box, along with a selection of retro uniforms, shoes, and accessories. Some codes unlocked the content directly, and were released during the season to celebrate certain events. Others awarded NBA Store points to unlock them manually, as well as Dynasty points for purchasing extras for your team in Dynasty mode. NBA Live 2004 even featured a handful of rookies that could be unlocked with codes. 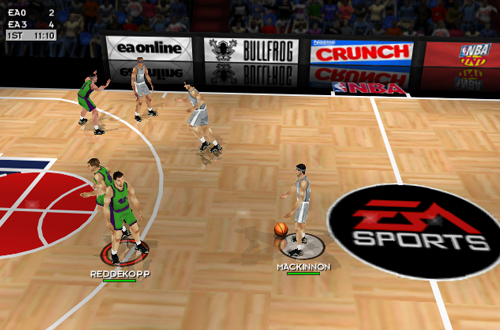 NBA 2K has featured similar cheat codes over the years, including the old standby “payrespect”, which unlocks an ABA ball. Other hidden features include developer teams, boosts to ball handling for your MyPLAYER in the early MyCAREER modes, unlockable uniforms, hidden dunk contest dunks, and wacky modifiers such as Big Head mode and tiny players. For anyone who didn’t feel like completing the Jordan Challenge in NBA 2K11 to unlock MJ: Creating a Legend, it could also be unlocked using the code “icanbe23”. Speaking of unlocking functionality, the strangest example might be IP to IP play in NBA Live 99, unlocked using the very apt code “ilovelag”! The method in which cheat codes were entered varied from game to game. Codes for NBA Jam were button combinations entered during the Tonight’s Match-Up screen. 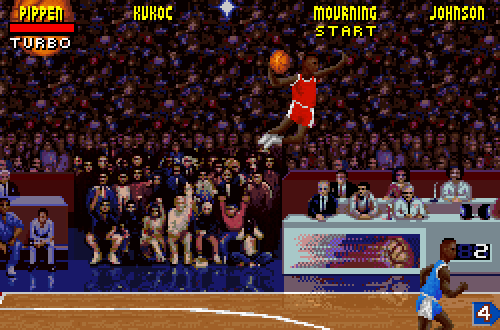 Midway changed things up in NBA Hangtime with three digit codes that were entered by pressing buttons the corresponding number of times, an approach similar to Mortal Kombat 3’s Kombat Kodes on the two-player Versus screen. Quite a few games used Create-a-Player to input codes, from NBA Live 96’s hidden players to the rappers in NBA Live 2003. The PC releases often required codes to be typed in during loading screens or on menus. Eventually, a special menu for entering codes was adopted. As traditional cheat codes began to fall out of vogue, they became less common in basketball games as well. Wacky gameplay modifiers were phased out, with sliders taking care of most gamers’ needs. With content updates becoming more viable, any new jerseys, accessories, and so on, have come to be added via patches. The prospect of recurrent revenue through microtransactions has meant that pay-to-win mechanics have replaced cheat codes as a way of getting ahead or unlocking certain content. NBA 2K’s Locker Codes and the Daily Spin in MyCAREER are the modern way of getting freebies, though the specific content we receive isn’t always guaranteed. Arguably, gaming has changed too much for cheat codes to be as prominent as they once were. Concepts such as consistent content updates, Locker Codes, and pay-to-win mechanics have rendered them something of a relic that seems out of place in modern hoops games. I wouldn’t mind seeing their return, though. Throwback content is always welcome, and as long as they can’t be used to gain an advantage in online play, they could still be a fun feature in sim and arcade games alike. If nothing else, they remain a fond memory of a time when we had fun discovering secrets and bonus content, as well as messing around with some silliness on the virtual hardwood.